Picked this dress up from Monki a few days ago, it was in the sale as well so I thought why not. Its very Alexa Chung from "back in the day" and pretty much the sort of thing I'll be wearing everyday going forward into summer. Just a simple, easy to wear, fuss free dress. Like I said a before, Monki is an amazing place to shop, their pieces are so simple and quirky. Best of all they are reasonably priced, sort of like a higher end H&M sort of vibe, That "Scandinavian cool" thing thats so hard to get completely right. I'd highly recommend checking out the brand if you're not familiar with them! Now they have their first UK store in London I can see myself spending alot of money in there. I'm wearing the Models Own polish I mentioned a few posts ago called Hedonist. It is a bright bright neon coral pink, which I cant even capture on camera properly as its just SO neon! I cant stop staring at my finger nails! The weather has started to turn so going without tights was probably a silly idea. I didn't leave the house apart from to go to the post box and a obligatory Sainsbury's trip for chocolate! I ended up staying up till 4am watching Wrestlemania so it took me ages to get out of bed this morning. I then HAD to watch the new episode of A Game of Thrones (which was pretty good! ), so I've spent most of the day procrastinating and catching up on TV! 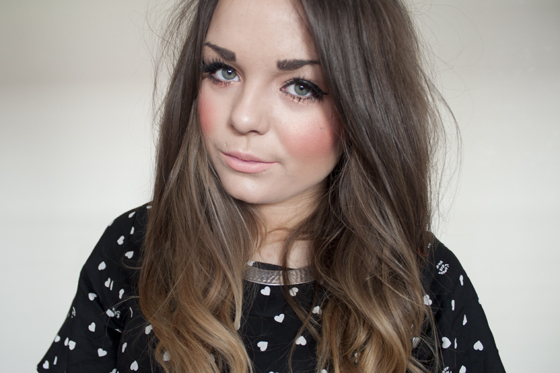 I really like your blusher in this post! What is it? love that dress! I'd never heard of Monki before I saw on your blog about the neon clutch you wore to fashion week. Have since saw so many lush things from there on other blogs. Love that dress! Your right, it's very Alexa from her T4 days! So cute! The dress looks lovely with the loafers. I love Monki, they have so many effortless cool pieces. i know (: i was just making the comparison! The heart motifs and tangerine hued nail lacquer are super cute! I just checked out Monki. I love it; will have to visit the London store. I found your dress in the sale on the website. Very tempted to buy it but I think I'll wait until I next go shopping in London and check out what they have in store. This outfit looks really cute! 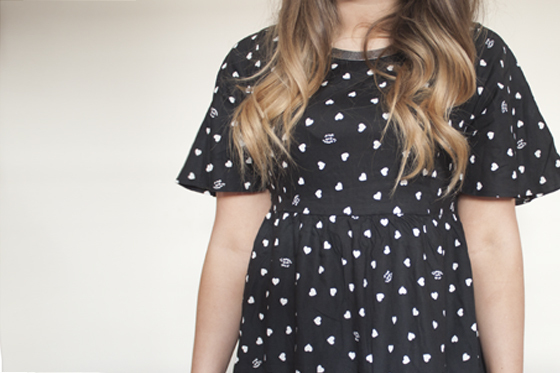 I love the polka dots with the hearts. 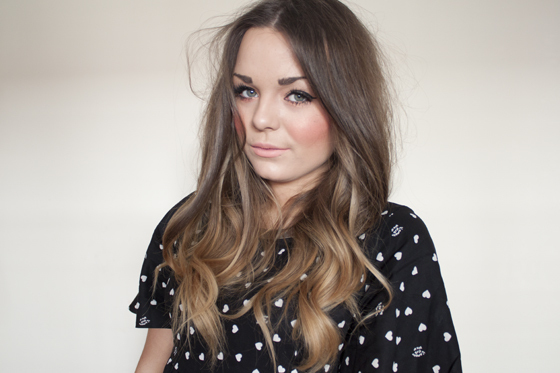 That dress is really pretty, I can't wait to visit Monki when I'm next in London! What a cute dress!And the rings I´ve orderd are beautiful.I am so pleased with the random mix!Thanks. PERFECT HAIR AND NAILS AS WELL! Working just off Carnaby St did some serious damage to my bank account now Monki opened... Hahaha! haha i can imagine! working around there would be bad for my bank balance too! Definetly going to be needing some of these simple style dresses for the summer and this one sits so nicely I'll be checking this brand out! I love the dress, have to check the Monki store asap! Love monki! They have great clothing for a nice price :) really cute dressy, nice it was in sale! I love how it's pol a dots but with little love hearts, so cute! 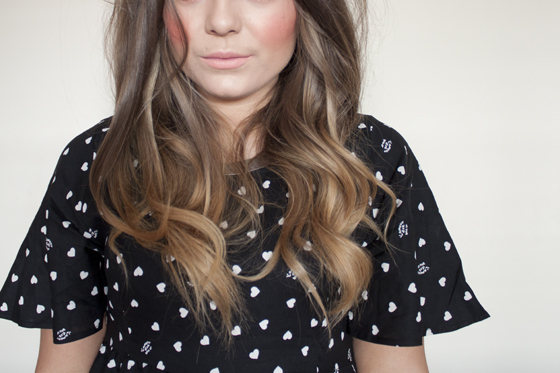 Also love your cheeks, such a lovely colour! I hate when the camera doesn't capture the correct colour, I had gel nail polish on last month and it was neon pink and didn't photograph the same! neon pink is SO hard to photograph! normally it comes up a light pink colour when i take them on my camera! so awkward\! id highly recommend checking them out! I love the way you do your makeup, and your nails look so nice with it and the dress, perfect! loving the heart print! it reminds me of my heart print romper i jsut posted about too!! You know, I reeeallly wasn't too sure about this dress when I saw the thumbnail in my newsfeed. 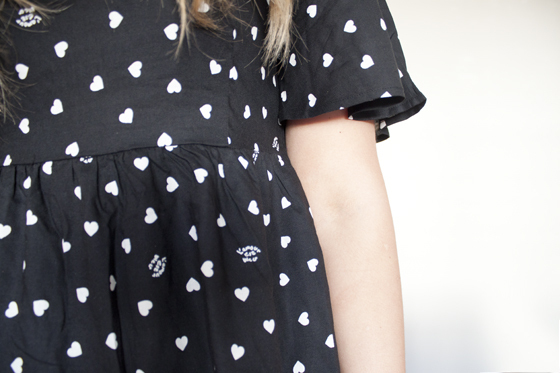 But the sweet little polka-heart print has won me over. I love you rings, as usual. I must go jewellery shopping. yup! was only £12 which i just couldn't pass up on! Love the dress, Monki have some really great clothes! this dress is gorg! I've been looking for a really nice polka-dot esque dress for ages thanks for sharing! This is such a pretty dress! I hadn't realised Monki had a London shop now, exciting! yup its on carnaby street & there is a concessions store in selfridges! i love this dress! it looks so lovely on you. What size did you get it in? I have never shopped in Monki before so I don't know how their sizes come up! Mines a XS, I normally wear small in monk but some of their stuff comes up quit big (as in oversized fit not in sizing)! i love the dress and your hair looks lovely!